A great-value portable practice tool. Not ideal for live use. Boss's flagship GT series has been around long enough it's almost part of the furniture, but the brand new GT-1 marks a dinky departure. Featuring a sound engine derived from the bigger, premium-priced GT-100, the GT-1 contains 99 preset and 99 user patches each built from a chain of blocks that can draw from 108 effects, including 27 amp/speaker sims and a 32-second looper. Four AA batteries will give you seven hours of playing (or you can plug it in, of course) and its been designed with no sharp edges so it can slip into a gigbag pocket with ease - although this means that it has a plastic base, which inspires less gigging confidence than the rugged metal top surface. The first two footswitches scroll through patches, while the third (CTL1) footswitch is used to turn an effect, or a combination of effects, on and off in a patch, or for tap tempo. The treadle handles volume and wah, but also other parameters, including Whammy-style pitch bends. For additional control, you can also fork out for up to two extra footswitches, or another expression pedal. Many of the presets are playable straight off the bat. There are useful facilities to get you started: Easy Select allows you to choose your patches by genre, distortion, or effect type, while the Easy Edit facility lets you quickly tweak Tone, Vibes and Echo. These are assigned to three soft knobs that, in conjunction with dedicated buttons for each block, take care of deeper (but still easy) editing tasks. Easiest of all is to connect a computer and use the free Boss Tone Studio software, with its brilliant graphic display. While the COSM amp sims will give you an approximation of the real thing for recording, at this price, you don't get the playability and detail of high-end modelers. Likewise, the overdrives and distortions work really well when building a patch but, used as solo effects, have less of the impact of real analogue pedals. The acoustic guitar simulator is class, though. 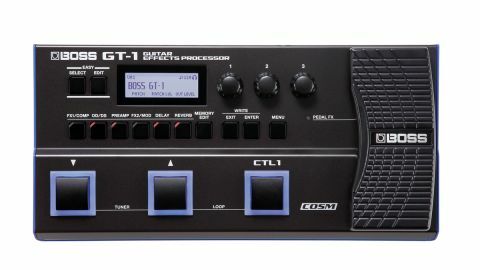 For live use, the GT-1 doesn't have the flexibility of bigger units where you can switch individual effects, although you could get by in a live situation with careful sequential use of your own patches and the CTL1 button.